When Mohamed fled his home at the age of 14, he left in search of a means to make a living. Today, nearly 20 years later, Mohamed says he no longer works just to make a living—he’s working to make a life. 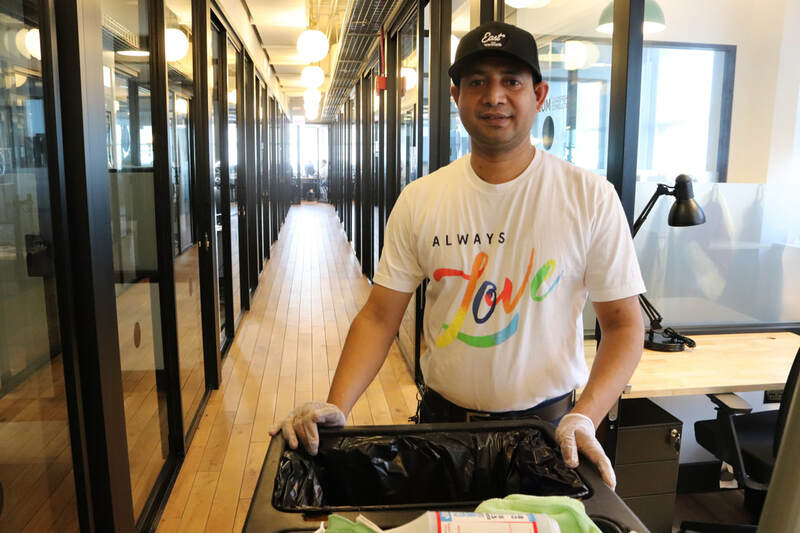 That’s the motto at WeWork, the shared-workspace provider where he’s been employed since May 2017. Mohamed is one of more than 150 refugees hired nationwide (including 5 RefugeeOne clients) through WeWork’s Refugee Initiative, piloted in in early 2017 to provide recently-resettled refugees with employment opportunities. Since then, the company has committed to hiring 1,500 refugees over the next 5 years. Their observations were confirmed in a recent report on refugee employment*, which found that the turnover rate for refugees was up to 15% lower than employees overall. Higher retention rates also mean increased savings for employers. But for WeWork, the benefits of hiring refugees go far beyond the bottom line: they also found inherent value in hiring talented individuals from non-traditional backgrounds like Mohamed. “It’s really important to recognize the contributions of refugees—they’re not just making our business stronger, they’re making our communities stronger, too,” said Mo. ​Refugees like Mohamed strengthen our communities in many ways, from paying taxes to purchasing homes—which Mohamed is already saving to do. But his journey to self-reliance in the U.S. did not come without difficulty. Less than a year after fleeing home, as the humanitarian crisis in Burma continued to escalate, Mohamed’s father passed away. Before he could return home, his village was burned by the violent Burmese military regime, leaving his mother and siblings displaced in a refugee camp. With no place to call home and little opportunity available to him in Burma, Mohamed spent the next 6 months working long hours in a clothing factory in Yangon to save enough money to make the difficult journey to Malaysia. ​Even in Malaysia, where Mohamed met his wife and they had their first two children, life was challenging. Without proper documentation, they weren’t able to legally work or send their children to school. Mohamed and his family arrived in Chicago on September 15, 2014 after a series of rigorous background checks. Refugees are screened more carefully than any other travelers to the U.S. Within a week of arrival, Mohamed was enrolled in English classes at RefugeeOne. After only 6 weeks in Chicago, Mohamed found his first job working as a janitor at a local business on the night shift. Every morning as he was leaving work, he drove straight to his English classes, which started at 8:30 a.m. He continued working that difficult schedule while RefugeeOne helped him find another position at WeWork with better hours, wages, and benefits. For example, when Mohamed’s wife was hired at another WeWork location, the company coordinated their schedules so one of them could be home with their children at all times. Recently, Mohamed asked to be switched back to the evening shift. When Carli asked why, he said he wanted to sacrifice his day shift so he could go back to school. As a refugee from Burma, Mohamed was denied the right to work before coming to Chicago. Today, he's proud to be progressing in his career at WeWork. RefugeeOne's Workforce Development and English classes are possible thanks to The Albert and Anne Mansfield Foundation, Conant Family Foundation, Elizabeth Morse Genius Charitable Trust, Jewish Federation of Metropolitan Chicago, McCormick Foundation Communities Matching Fund, a McCormick Foundation fund, Paul M. Angell Family Foundation, Rivers Casino, and donors like you! Carli, Mohamed's supervisor at WeWork, says Mohamed's dedication is contagious. "He is so humble and hardworking. He comes to work with a smile on his face every day."